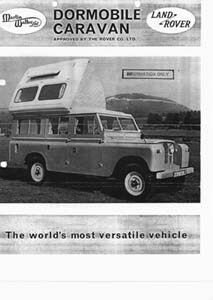 Below are JPEG images of old advertising materials that I have found for the Martin Walters Land Rover based Dormobile. Click on the image to see an enlarged version. The enlarged image will appear in its own window. This page will remain on your screen below the window with the enlarged image. 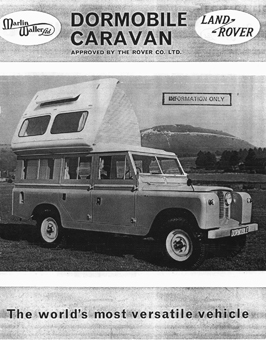 Martin Walters still exists as a company but has not been making Dormobile conversions since the early 70s. They do not provide replacement or repair parts for Dormobiles. They are no longer at the address provided in the collateral. 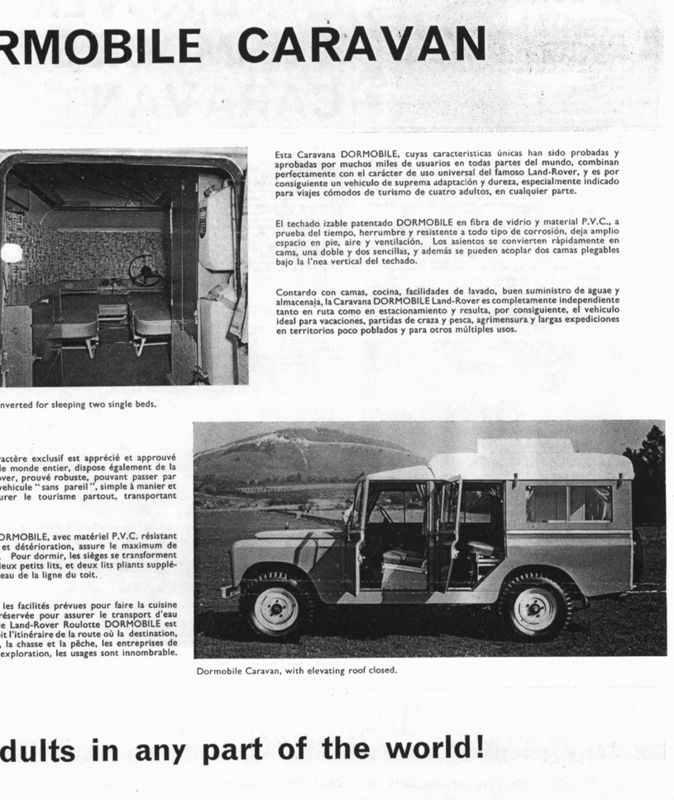 The first two images are the front and back of a single sheet showing a series II four door Dormobile. This was evidently a dealer handout to potential customers. The year of the car is between 1958 and 1960. 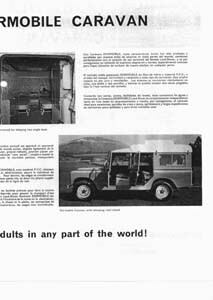 The next image is an advertisement showing a different pre-1968 land Rover four door Dormobile. 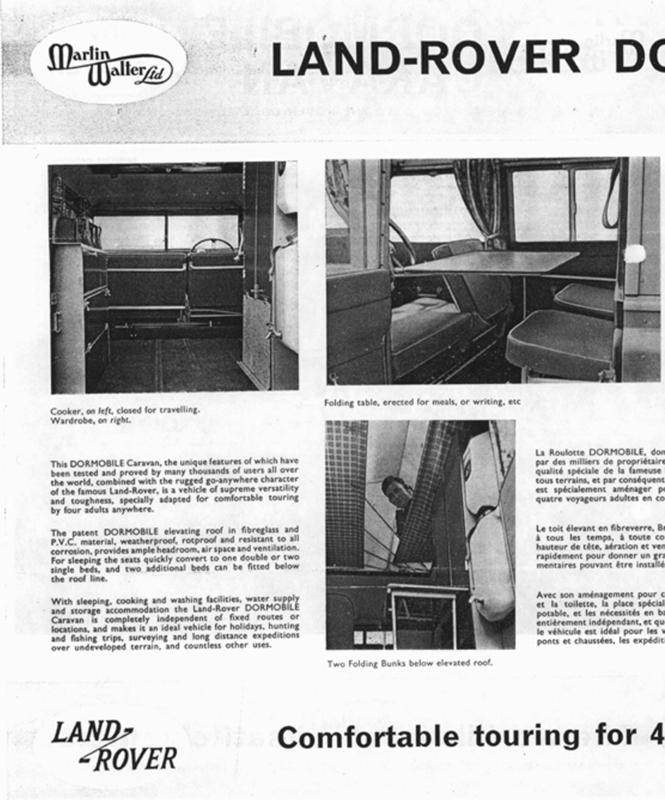 The next 4 images are the front and back of a double sheet showing a series II four door Dormobile. This was evidently a dealer handout to potential customers. The year of the car is between 1958 and 1960. The wording in the brochure is a bit fuzzy. I do not have the original to rescan. The specifications listed are identical to the specifications provided in the 2 page brochure at the top. 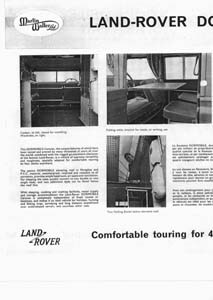 This next one is a partial scan from some sort of brochure that shows the dimensions of the seats and sleeping arrangements for a four door Land Rover Dormobile. 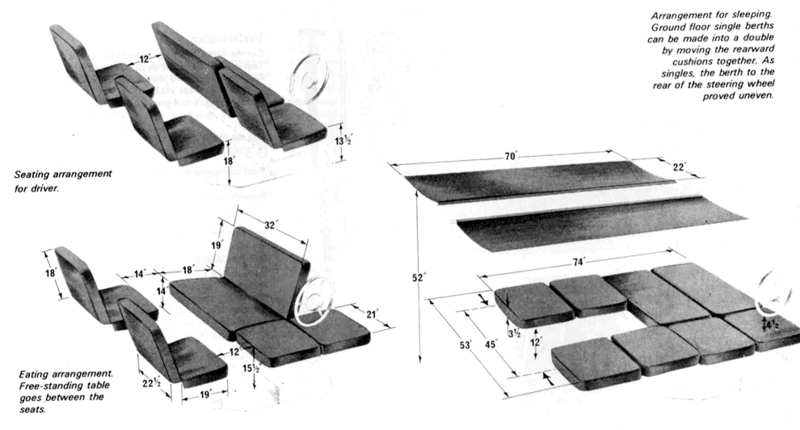 One of the rear seats can slide over to the side of the other creating a double bed. I understand that a foam pad or an air mattress smoothes out the cracks and unevenness making the bed a lot more comfortable. The two door version did not have the lower seats shown. 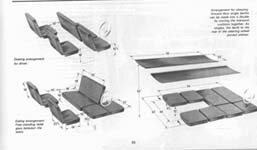 The folding top cots provided the sleeping arrangements for two people. The top bed is listed as 70 inches long. There are a few inches of space at the head and at the foot of the top bunks providing extra space to fit a six foot person and a full size pillow. The cot is narrow but a sleeping bag does not allow you to sprawl anyway. Since the weight of the sleeper compresses the bottom of the sleeping bag there is no insulation under the sleeper. This makes for cold sleeping in low temperatures. Some people have modified the cot to have a layer of insulation. Others use an insolite pad when the weather is cold. I have a 12V electric blanket. If you would like to learn more about the rare Martin Walters Dormobile you can visit John Hess's unofficial Dormobile web site.